Blogging is a great way to drive up awareness about your company, and it’s also an excellent strategy for branding yourself as a thought leader. But, unfortunately, many B2B marketing blogs or trade blogs have also developed a reputation for being dry, rote, or boring (or, even worse – salesy). There’s obviously tons of great info out there about writing better business blogs – especially about better writing techniques for more engaging or entertaining B2B blogs – e.g. how to manipulate voice, use jargon, punch up vocabulary, etc. to keep people hooked on reading. However, as a company obsessed with good ideas, we know that it’s not just how you say something that matters – but also what you’re choosing to say. So, we thought it might helpful to look into what types of content are good at beefing up B2B blogs – that is, what actual blog topics work for capturing the attention of potential customers, and making them want to read more of what you write. If you’re looking for some good topics to help you create one of the best B2B blogs on the web, the below 5 ideas will work to make your content stream more engaging – and help you drive more leads. They drive traffic. Bloggers with B2B marketing blogs have seen huge increases in traffic after posting expert blogs. Check out two real life success stories from SEO Hacker and Smart Blogger. They make you an expert by association. It’s possible that little – or even none — of the info in the expert roundup will come from you. However, if you publish a blog with tons of awesome info that tons of people see, your brand will be associated with that helpful knowledge. They help you build relationships with other standouts. To gather the content for a roundup post, you’ll need to reach out to and connect with industry experts. Those who you have a back and forth with – and publish – can become good connections for future partnerships, projects, guest blog posts, etc. etc. Expert roundups are great networking tools. They are helpful for link-building. When you publish the knowledge of other experts, there’s a good chance they’ll want to link to your post with their blurb on their own website, blog, newsletter, etc. The best b2b marketing blogs have tons of links to them across the web. These links help boost the authority of a domain and improve SEO ranking. Help pull back the curtain and give readers insight into what goes on behind the scenes at your company by sharing a “Day in the Life” post of one of your team members. Digital agency emagine has a good example of an employee spotlight blog series. Choose someone outside of the marketing sphere – who handles an operation that might be more interesting or relevant to the customer – and include a daily schedule, photos, and any other interesting information about what makes them particularly good at their job. Giving people a peek behind the scenes offers them insight into your company culture, which can help build trust and loyalty. Lots of companies offer straightforward advice for other businesses in their blogs – lists of tips about what they should do to improve business practices. However, one powerful blogging strategy for the best B2B marketing blogs is to turn that idea on its head and offer an “anti-advice” piece – or a list of strategies companies should never try out. (We did this on our own blog a few months ago: 9 Tricks to Make Sure Your Marketing Tanks in 2016). Anti-Advice pieces can be funny without needing to land any jokes, and they can capture reader attention because they’re different from most of what’s out there. In an interview with Oz, Tom Pick, a digital marketing consultant and the managing editor of Webbiquity, offered some advice to B2B bloggers looking to make more engaging content: “Humor can be challenging (and subjective), but don’t be afraid to take an atypical or snarky approach when appropriate.” Pick’s B2B marketing blog, Webbiquity, did this particularly well in the piece Four (of the) Worst Practices for Pitching Bloggers. Networking. You can reach out to the author to let them know about the review and your blog. Link building. That author might want to link to your review (if it’s a good one!) on their site, blog, etc. Establishing authority. The people considering doing business with you will see that you are knowledgeable and interested in learning more about what you do. You get to read a book! offer specialized, expert knowledge about your industry in an easy to digest format (eye tracking studies have shown that readers like to look at information-laden images). Also, infographics are a good tactic for getting your content shared around social media. Designing your own customized infographic (with your company logo, aesthetic, etc.) can be a good way to build brand awareness. In fact, according to a report by CMO Council, 65% of senior marketing execs believe that visuals like infographics are “core to how their brand story is communicated.” Just make sure that your branded Infographic is filled with useful statistics – as well as context — information about why those statistics matter. The new frontier in B2B marketing might just be interactive content, so if you want to have one of the top b2b blogs on the web, you need to think interactive. Interactive content is a wide genre, and it essentially encompasses all content that you can click, move, manipulate, or generally interact with. There are tons of reasons for bloggers to use interactive content in their B2B blogs (check out this blog post we wrote about it) – including the fact that it convinces people to buy and it appeals to a short attention span. Not sure what kind of interactive content to create? Consider creating a blog post with a link to a branded calculator, that can give potential customers a chance to press buttons and crunch numbers – and ultimately derive something useful for them. An example? This Google spreadsheets calculator linked on VWO’s blog can help you determine whether AdWords will be worth it for your SaaS business. Alternatively, another good interactive content choice for B2B blogs is a quiz. Create a quiz testing someone’s knowledge in their industry, or one that helps a potential customer determine what product or service to buy. Then, ask for their email to send them their results. This kind of content doesn’t only encourage engagement on the part of readers — it can also help you capture leads. One great example of a quiz that works is “Are You Smarter than a B2B Marketer?” posted on the blog of call analytics company Invoca. Are you interested in creating an infographic or piece of interactive content to drive traffic to create one of the top B2B blogs in your industry – but you’re not sure where to begin? 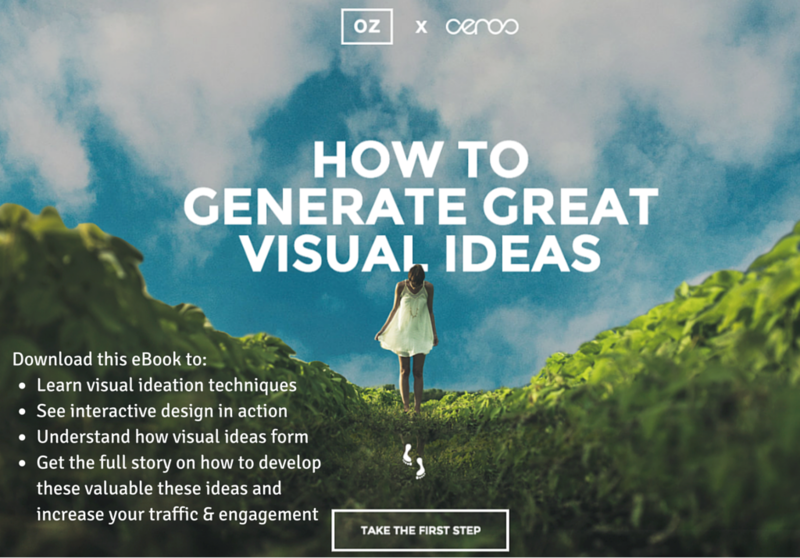 Our ebook, How to Generate Great Visual Ideas, created in partnership with Ceros can help you get started. 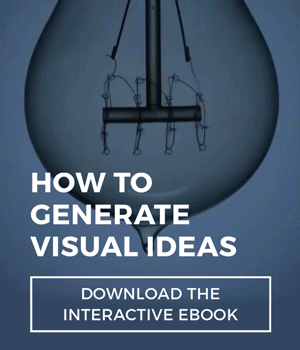 It’s filled with visual ideation techniques, psychological insights, and info about what makes an idea good, so you come up with a content idea that works.